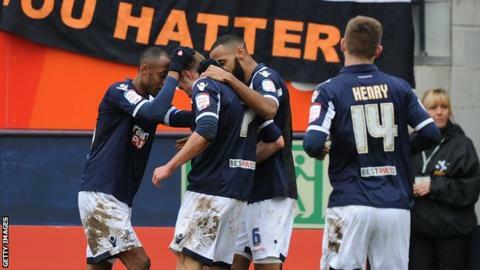 Championship Millwall claimed a place in the quarter-finals by bringing Luton Town's remarkable FA Cup run to an end. The non-league Hatters created chances, with Andre Gray and Arnaud Mendy drawing good saves from David Forde. But Janos Kovacs's error let James Henry in for Millwall's early opener, before Rob Hulse doubled their lead with a fortuitous hooked volley. Luton showed persistence but conceded a third when Dany N'Guessan finished off John Marquis's parried shot late on. The Hatters' run had taken in wins over Championship side Wolves and, in the previous round, Norwich City of the Premier League. But they failed to to become the first non-league side to reach the sixth round in 99 years after meeting a resolute and determined Millwall. The match started well enough for the Blue Square Bet Premier side, 67 places below the Lions on the football ladder, and they drew early saves from former Luton loanee Forde through Gray's shot on the angle and Mendy's powered effort from short range. But they were the masters of their own undoing when they allowed Millwall, who have struggled in the Championship lately, to take the lead. Ronnie Henry, attempting to keep possession, headed a routine long ball back towards centre-half partner Kovacs, who mis-controlled and let in James Henry. The former Reading winger made no mistake as he skipped around Mark Tyler and finished from a tight angle. The travelling fans made their delight clear, but there were few signs of any trouble, as memories for both sets of supporters were taken back to the violent scenes of the Kenilworth Road riot in a sixth-round Cup fixture between these sides 28 years ago. Millwall, who had won their last 13 ties against lower league teams, required a slice of fortune for their second. Hulse could only head Henry's deep cross high into the air. But the striker turned and, as the ball dropped and with his back to goal, he hooked it off his shin and into the far corner. It was a deflating blow for Luton, whose Cup exploits have come at the cost of their league form and their determination to regain their Football League status after a four-season absence. They have now gone four league games without a win and are slipping away from the promotion hunt. They showed signs of a revival in the second half, with Gray's pace proving a constant threat, most notably when he was released by Jonathan Smith and saw his effort smothered by Forde. But Millwall, beaten finalists by Manchester United in 2004, remained composed and wrapped up the tie late on. Marquis's low effort was stopped by Tyler in the Luton goal, but N'Guessan was on hand to pop in the rebound. The Hatters saw Jon Shaw's injury-time shot cleared off the line but the three-time semi-finalists will now have to dwell on their fairytale run while attempting to mastermind a return to the Football League.